This post is sponsored by Pacific Foods — a brand I’ve loved and used for many years! Thank you for supporting the brands who keep The Kitchen Paper up and running. Cinnamon rolls are one of those things I rarely make, since it usually means making a huge pan of them. I just can’t handle eating that many cinnamon rolls in one day, and you KNOW they’re best eaten the first day! 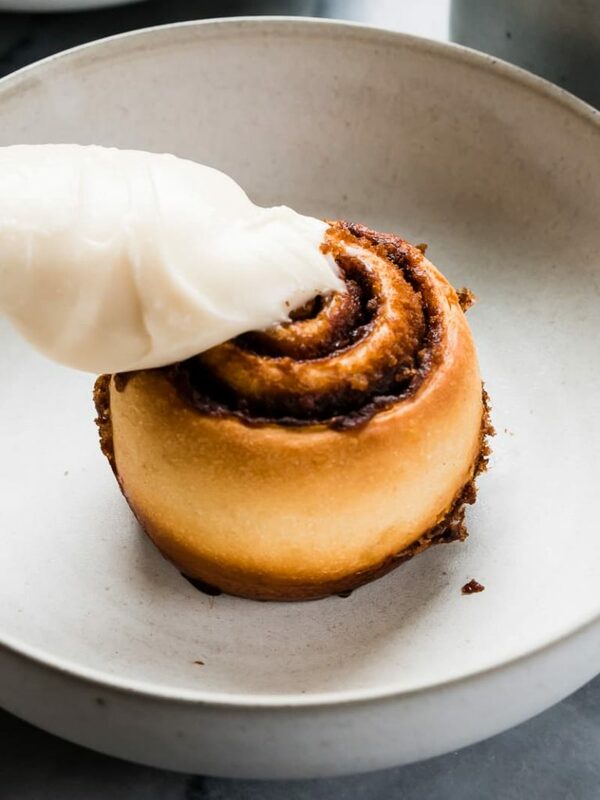 Enter: small batch cinnamon rolls. I’ve been wanting to figure this out for a while, and it turns out it’s really pretty easy. 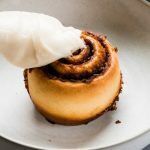 More than just small-batch, these rolls are also vegan (but without all sorts of crazy ingredients you don’t have!)! 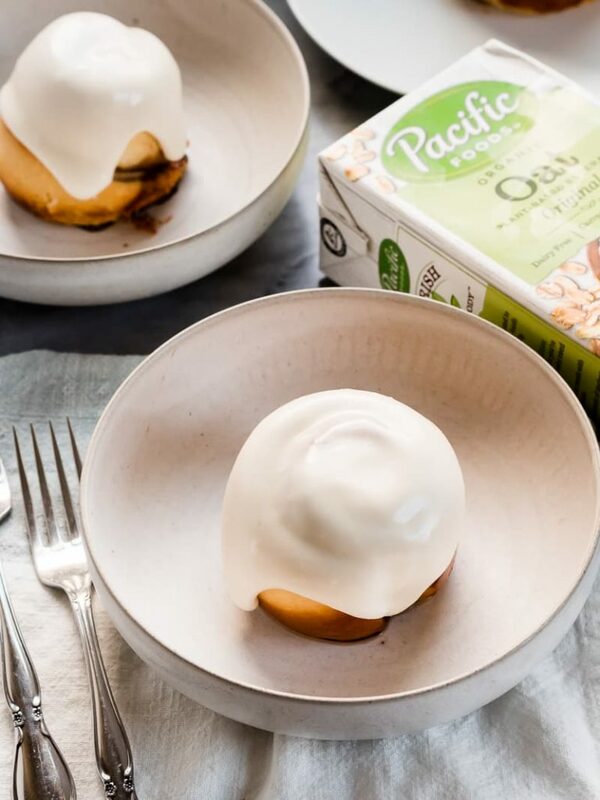 The only changes I had to make to make this vegan, based of of my normal cinnamon roll recipe, were to omit the egg, use Pacific Foods Organic Oat Beverage instead of milk, and use coconut oil instead of butter. EASY! Oh also: if you want cream cheese in your frosting (as I always do), get some vegan cream cheese (it’s really delicious and not much different than what you’re used to!). I’ve been making this recipe (to test, ya know!) every weekend for the last month and am REALLY into it. It takes just a few minutes to mix up the little ball of dough and knead it smooth. Let it rise for a couple of hours, then shape (again, quick and easy because it’s so small), cut, rise again for 45 minutes, and bake! DONE! 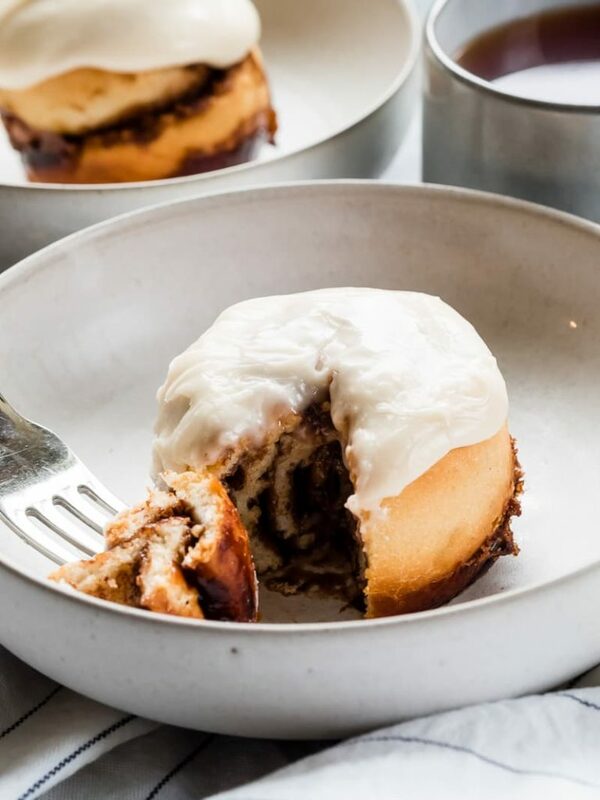 Originally I was going to call this a recipe for two cinnamon rolls … but I kept on accidentally making three. My (two) roommates (husband & brother) don’t seem to mind! That said, if you really only want to make two: make sure you roll the dough out in a really thin strip when shaping. 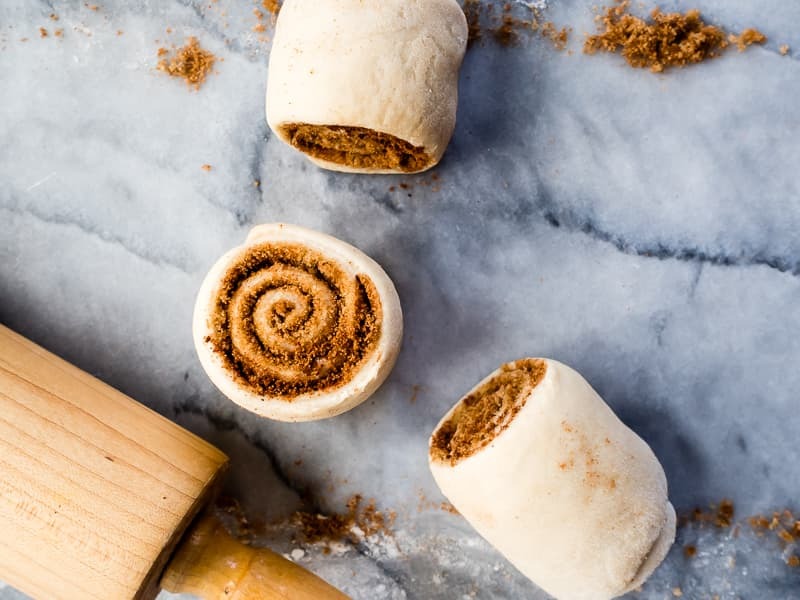 This small batch recipe yields 2-3 vegan cinnamon rolls without any unusual ingredients. They’re light and fluffy, and take about three hours to make. In a very small mixing bowl, heat the oat beverage to 115F (no hotter), then stir in 1 Tbsp sugar before sprinkling the yeast over top. Let the yeast proof for 5 minutes. While the yeast is proofing, whisk together 3/4 cup plus 1 Tbsp of the flour, the salt, and remaining 2 Tbsp of sugar. Once the yeast has proofed, add it to the flour mixture along with 2 Tbsp melted coconut oil. Mix to combine (I found my hands to be effective here), then begin kneading. 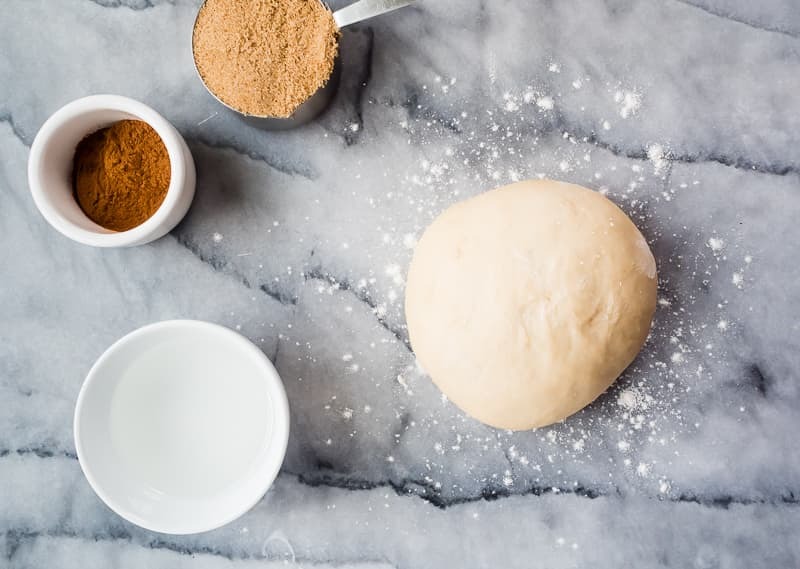 Knead between your hands, or on a countertop, using as little flour as possible — you should not need to use more than 1 (maaaybe 1.5) Tbsp extra during this process. Place the dough into an oiled bowl, cover with plastic wrap and a kitchen towel, and let rise until doubled in size: about 2 hours. When the dough has doubled in size, turn it out onto a lightly floured surface, and roll out into a long, thin rectangle (approximately 4″x12″. If it is pulling back too much, let it rest for five minutes before trying again. Pour 2 Tbsp melted coconut oil over the rectangle of dough, and spread it over the surface — leaving 1 cm at one short end dry. 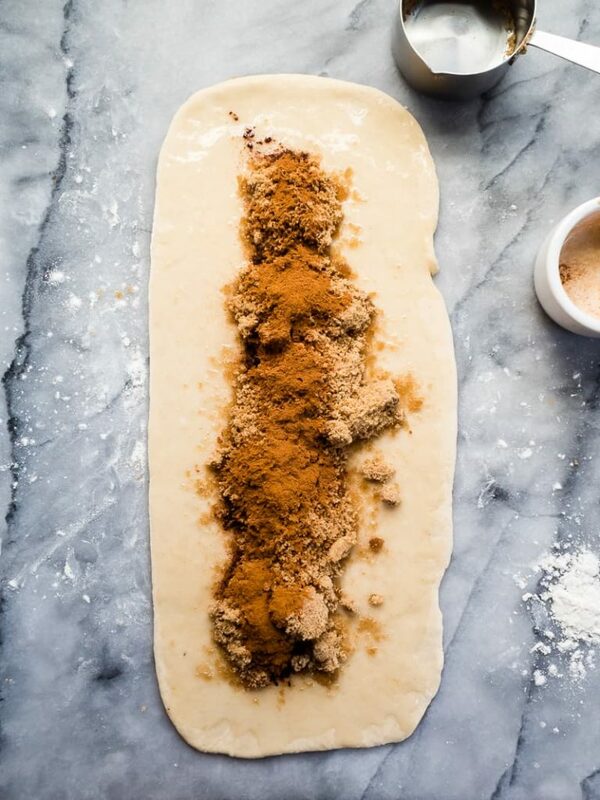 Spread the brown sugar and cinnamon evenly over the buttered area, and gently press into the dough. Roll the dough tightly, from the short side, into a log. Press the seam closed. Cut the log in half, or into thirds, taking care not to squish it too much. I use dental floss wrapped around the entire log for this. Place the rolls into a lightly oiled pan, or individual muffin tin wells. Let rise for 45 minutes covered with a kitchen towel. Preheat the oven to 350F, and when the rolls are ready, bake for 20 minutes. The tops should be turning brown, but just barely so. Remove from the oven and let cool just a few minutes before removing from their pan (they will stick if you leave them too long). To make the frosting, use a fork or small whisk to combine the vegan cream cheese, oat beverage, vanilla, and powdered sugar. Stir vigorously until smooth. When the rolls have cooled slightly, liberally spread the frosting over the rolls. Hi Mary…this recipe sounds amazing. Is there an alternative for Pacific Foods oat beverage? We don’t get that here in New Zealand. I also loaned your book Nut Butters today from the library. I feel totally inspired…what a great concept. Clearly a good machine is vital. Any tips/advice regarding a good machine? Hi Gilly! I’m not sure what brands are available to you, but any oat milk or oat beverage will work! As for good machines for nut butters: anything with a heavy duty motor! I’ve found Cuisinart brand to be reliable and powerful enough to do the job, but I know other people have success with Ninja. Good luck! !